Abu Dhabi National Exhibitions Company (Adnec) has announced a sponsorship agreement between Idex and leading national and specialty defence companies including Emirates Defence Industries Company (EDIC), Tawazun Holding and Abu Dhabi Ship Building (ADSB). The agreement endorsed EDIC as the strategic partner and Tawazun Holding as the principle partner for Idex 2017 and named Abu Dhabi Shipping Building as the principle partner for Navdex 2017, said a statement from the organisers. The events will take place from February 19 to 23, at the Abu Dhabi National Exhibition Centre, Abu Dhabi, UAE. Luc Vigneron, CEO, Emirates Defence Industries Company; Saif Mohamed Al Hajeri, CEO, Tawazun Holding; Mohamed Saeed Al Ghas, corporate commercial director, Abu Dhabi Ship Building; and Humaid Matar Al Dhaheri, acting group CEO, Abu Dhabi National Exhibitions Company attended the official signing ceremony. Organised by Adnec in cooperation with the UAE Armed Forces under the patronage of HH Sheikh Khalifa bin Zayed Al Nahyan, President of the UAE and Supreme Commander of the UAE Armed Forces. “Definitive events in their respective fields, the upcoming editions of Idex and Navdex convene major decision makers and key international defence players and personnel to exchange defence know-how and cement lucrative deals in the sector,” he said. He added that Adnec deploys a multi-pronged strategy and maintains effective communication with all partners to consolidate Abu Dhabi’s leading reputation regionally and internationally as a prestigious hub for world-class exhibitions and conferences. 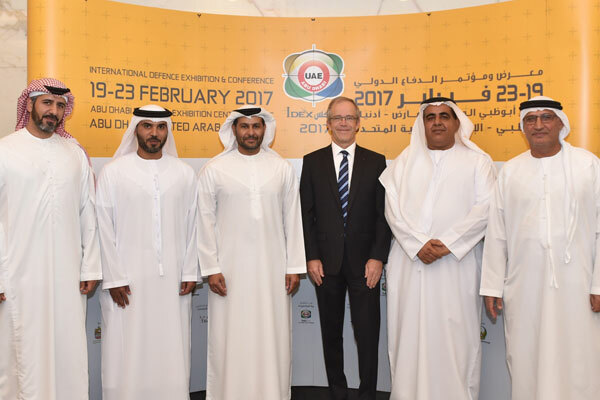 Al Dhaheri expressed confidence in the success of the upcoming editions of the events, and applauded the exhibition that first took place 23 years ago for growing from strength to strength. He attributed the event’s development to the steadfast cooperation between national entities that worked synergistically to ensure a well-rounded and effective experience for exhibitors and visitors. “Major regional and international players in the naval and defence industry now consider the UAE an important hub for defence-related transactions and knowledge,” he added. “Idex 2017 offers a great opportunity to meet and foster relations with key international and regional defence experts and decision makers. EDIC, through its strategic partnership with Idex, will emphasise its leading role in the nation’s defence industry and highlight its contribution to the latest developments in defence technology,” he stated. “Moreover, it provides a unique platform to showcase best-in-class technologies, machinery and equipment by EDIC – a group that comprises 16 subsidiaries, each a leading specialist in local and international markets,” Vigneron concluded. Al Mazroui confirmed that ADSB’s pavilion at Navdex 2017would showcase the latest technologies, products and services from the ship building industry.